It's cookie baking season at our home and we have been enjoying spending hours huddled in the kitchen in a cloud of flour, vanilla, cinnamon, icing sugar and everything nice. Typical winter - the rain beats relentlessly against the windows and the wind howls through the tiny gaps. The world outside is wearing a grey veil, with traces of green speckled over the bare fields. But this is not getting us down. We are in high spirits. It's cosy, warm and inviting here. We're wearing our big smiles and our aprons are dotted with colorful leftovers of our baking escapades. Christmas music fills the air and nothing can dim our cheer. Because we're baking cookies. There is nothing more satisfying than getting the whole family together to bake old favorites or try our newly found cookie recipes. One of my all time favorites is the crumbly and ever so elegant Austrian Vanilla Kipferl. It started a few years ago when I wanted to impress my, at the time new, mother-in-law. It was my first Christmas in the family and I wanted to do the whole shabang! We had invited them for Christmas Eve tea and later dinner and I decided that they were going to get the works. I dove right in and dug out many typical German recipes for duck, goose, vegetable sides, desserts and of course cookies. It was my project for weeks, fretting over this and that and in my perfectly organized manner wrote lists and planned everything to the last detail. It was Tom and my number one topic throughout the whole month of December and to be honest I would not have blamed him if he had packed up his bags and ran back to mummy. How did he get involved with this Christmas crazed chick? The truth be told - it was to be my first self-planned, self-prepared and self-cooked Christmas dinner! Well one of the things I baked for our tea was Vanilla Kipferl. These traditional Austrian specialties really epitomize Christmas cookies in Germany, Switzerland and Austria. You'll find them in every store, bakery and home during Christmas. 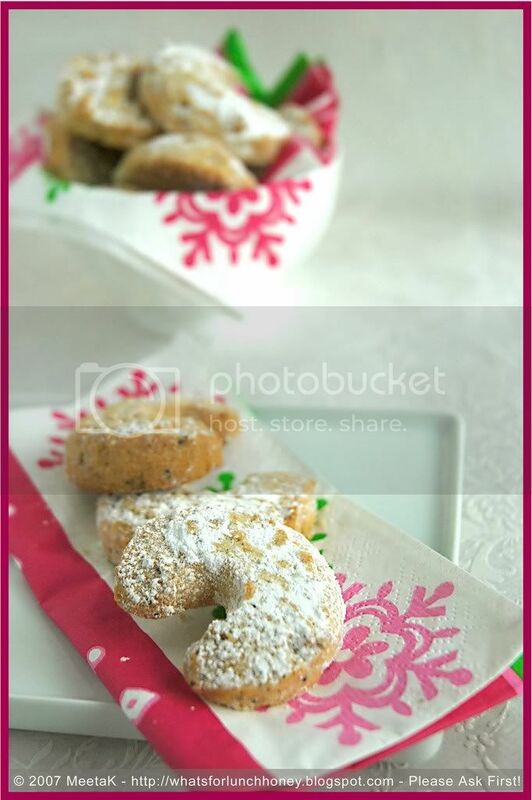 The small crescent shaped, nutty, butter tasting cookie has a strong flavor of vanilla. 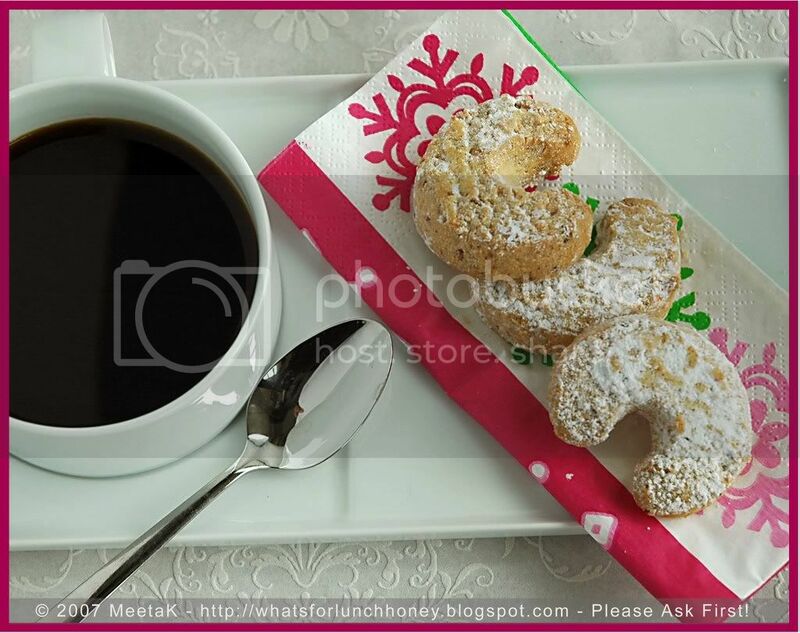 Usually the Kipferls are sprinkled in vanilla sugar after baking and when still warm. But they can also be baked with the flavoring of vanilla in the dough and then dipped only in powdered sugar. What can I say - in Germany they have a saying "Love goes through the stomach" - and if it is true then I think my in-laws fell in love with me that Christmas. As for me - I was exhausted that evening, but Tom told me the next day I went to sleep with a smile on my face. 70 g blanched almonds - finely ground. I sometimes coarsely grind them to add a new texture into the cookie. Cut open the vanilla bean and scrape out the pith. Combine together the almonds with the flour, sugar, salt, vanilla pith, and butter. Using your fingers, work flour–nut mixture into butter until dough resembles coarse meal or breadcrumbs. Mix in the egg yolks and knead to form a smooth dough. Wrap the dough in some plastic wrap and chill for approx. 30 minutes. This is an essential step, without the resting period, the dough will break when being formed into cookies. After resting cut the dough into 1/2 inch slices and roll each slice into a 3 inches long piece with pointy tapering ends; bend these into crescents shapes. Place on a baking sheet and bake in the center of the oven until light golden, about 12 minutes, rotating the sheets halfway through for even baking. The kipferls should not turn brown. After baking dip the still hot cookies into powdered sugar and/or vanilla sugar. 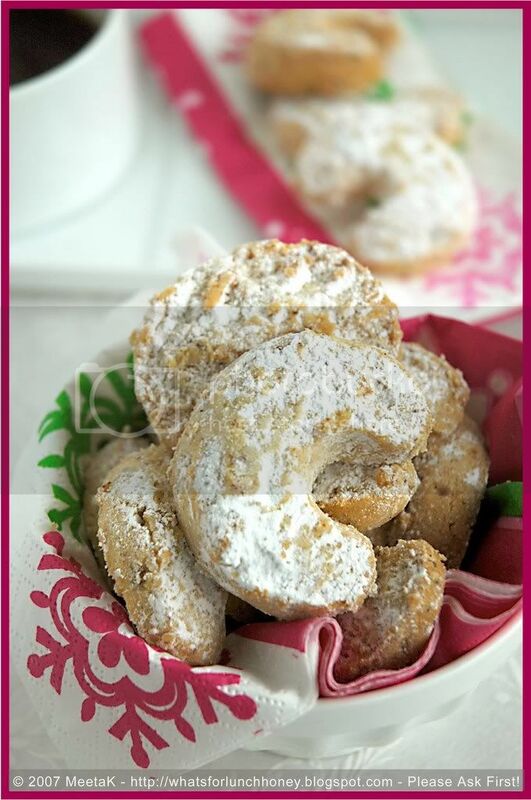 Handle the cookies with care, as they break quite easily, especially after baking. The cookies will keep for at least two weeks is a air tight container or a sealed cookie tin. My tip: Place the vanilla pod without the pith in the tin or container with the cookies. This gives the cookies an additional vanilla aroma. Making vanilla sugar: Keep granulated sugar and a vanilla bean in an air tight jar, after a few weeks the sugar will taste of vanilla. It's the mellow aroma of vanilla that makes us love these cookies. That and the wonderful flaky texture of the cookies when you sink your teeth into one. ´The way it crumbles onto the tongue opening up the vanilla and almond aromas is always pure joy. Important Notice: It seems Blogger is currently experiencing a bug that does not notify the blog owner if and when comments have been made by email. As I normally rely on this to respond to all the questions, queries and feedback made on my blog, I do apologize if I miss out on any of your queries, especially if made on older posts. If you do not get a reply to a specific query within a day or two please do send me an email. I hope Blogger fixes this soon. Meeta, these are fantastic! And I love this set of photos. The lighting, composition and lighting are excellent! Your in-laws are lucky to have you. No wonder your in-laws were over bowled over...those cookies look amazing. These remind me a bit of the wonderful Greek cookies -- are they called koulourakia? Something like that. Anyway, they are also crescent-shaped, covered with sugar, and buttery within. Yum. These cookies look great! u have been making so many sweet dishes these days I am guessing that u r spending the rest of ur time in the gym :)! just looking at ur pics makes me feel as though i have had all the cookies and gained a few pounds!! Hope you got my mail with the entry for Traditional feasts. We had a similar expression in my house: "The way to a man's heart is through his stomach." I guess it's a pretty universal sentiment, huh? Meeta!! Love those cookies n wonder how and when do you get time for food props?your parents in law must be so amazed!! Mmm, love these cookies :). These look so good Meeta and I know what you mean about that feeling when you've decided not do something which has become a bit of a tradition. Beautiful!!!! Who wouldn't love these??!!!! 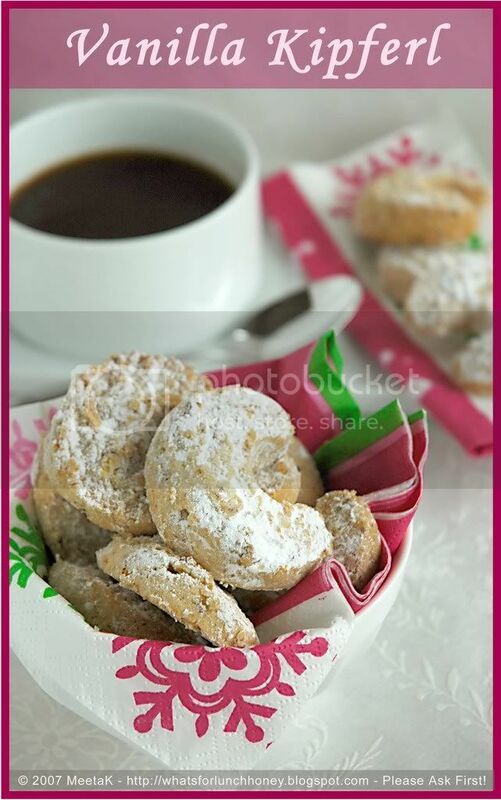 These Vanilla Kipferl cookies sound divine - I LOVE the aroma and flavor of vanilla!! Meeta, more than the cookies, I am eyeing at the accessories. Love the colourful napkin. Do you buy 'em from craft stores? My neighbor used to make these...they are so good. They melt in your mouth. 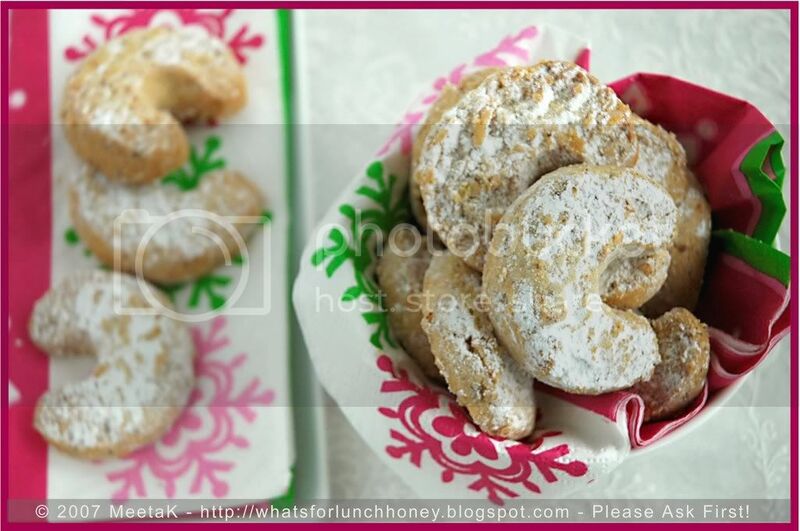 A long time ago in St Louis a Greek Neighbor of my sister & brother in law gave them a cookie recipe that was so wonderful and seems a little like this one! This is beautiful as always Meeta. I wish I were so organized as you ;) but then I wouldn't me me I guess. What a wonderful post! I love hearing of Christmas memories - it's such a great time of year! These cookies sound wonderful! This type of cookie is so popular at this time of the year. I won't be able to make them until the new year as I've cleaned out my pantry to move house. THey are really one and only. You are a fabulous stylist Meeta, i loved these photos especially the first one. You're brightening my day again, Meeta! I love Vanillekipferln - my grandmother used to make them every year. I LOVE that photo. I would love to just spend a day with you to learn all about your amazing food photography. You are incredibly talented! Thanks everyone. I am so glad you liked these. I also appreciate all your comments about the photos. Patricia, Hehehe! Glad I was able to win you over. Something had to give. Lydia, that's right they are very close to the Greek specialities. Priya, Actually I have been neglecting the gym been busy cooking and baking!! HC - oooh! well then here you go! SHN, girl I think we both have much company!! Susan, thank you so much. I am simply glad I was able to find something nice for your great event! Amanda - yeah - one year you think I am going to try something else and make everything different, but you end up missing it anyway! VG, hehehe! I could ask you to veganize these too but then I think I would have to have you over for each post. I too find the aroma of vanilla so gorgeous! Sug, thanks for the comment. I actually buy the napkins from anywhere I see them. MY supermarket, Ikea, etc. I see something and try to picture it in a shot. If it works then I buy it. Pea, oh yes they do. Tanna, we all have our edges and nooks. It makes us who we are. For me you are an inspiration every time I visit your blog and see a gorgeous bread. Deborah, yup those memories make things taste better don't they? Barbara, this cookie can be enjoyed anytime. Wish you all the best with the house moving! Cynthia, it's crazy isn't it? Teacroatia, they are the best. I'll stop by to check yours out. Archana, thank you so much! Never really thought of myself as a stylist - but I love it! JG - oh I am happy that these brighten your day. I thought of you when posting these. Happy cookie baking! Kristen, I'd love to spend a day with you too. Thanks for the feedback. Thank you Meeta. I fell in love with Vanilla Kipferl - on my visit to Zurich this time. Brought some back but ate too many too fast. Now I can try baking some just for myself.